If you are suffering from tooth loss, you are not alone. In fact, it is estimated that 69 percent of Americans over the age of 35 are missing at least one tooth. In addition, as many as one in four Americans over the age of 74 have lost all of their teeth. Tooth loss can occur from injury, disease, or poor oral care. No matter what the cause, Dr. Jeremy Jorgenson and the Advanced Dental Care staff are here to help you restore your smile with dental implants. With a 95 percent success rate and extensive list of benefits, we are proud to offer dental implants in Costa Mesa and Orange County. Dental implants are different than other forms of tooth replacement because they offer a permanent solution to replace missing teeth. The process to receive dental implants does require surgery and a multi-phased treatment plan. A titanium post is surgically inserted into the jawbone to replace the tooth’s root. The post is biocompatible to allow the jawbone to naturally fuse to the implant. Once the jawbone has healed, an abutment is attached to the post. Finally, a prosthetic crown is attached to the abutment to replace the tooth. In some cases, when tooth loss has been left untreated for a long time, additional procedures, such as sinus lifts or bone grafts, may be necessary to ensure the proper placement of the dental implant. Our world renowned periodontist, Dr. Joseph Yang, will perform all of these important procedures right in our Costa Mesa dental office. Unlike other forms of tooth replacement, dental implants provide a lifelong solution. Not to mention, dental implants offer a high success rate due to the materials used. When the materials are combined with the surgical process, you benefit from a form of tooth replacement that most closely mimics a natural tooth. In fact, you will have an increased biting force of 70 percent when compared to using dentures. Dental implants also promote oral health. When a tooth is lost, your bone begins to deteriorate. Over time, this causes your remaining natural teeth to lose support, causing them to shift and eventually fall out. The loss of bone also causes your facial structures to change. However, with dental implants, the implant post stimulates the jawbone. As a result, this not only stops the loss of bone but can encourage new bone growth. You will protect your remaining natural teeth and facial structures with a dental implant. Just about everyone who has tooth loss is a candidate for dental implants as long as the gums are healthy and there is adequate bone dentistry to support the implant. However, there are certain conditions that increase your risk for implant failure, such as medications, medical conditions, and lifestyle factors that hinder the body’s ability to heal. You will need to undergo a comprehensive evaluation to determine if dental implants are right for you. When making an important, lifelong decision to restore your smile, Dr. Jeremy Jorgenson and Dr. Joseph Yang of Advanced Dental Care are THE Costa Mesa dentist and periodontist for dental implants. Our dental team understands how an incomplete smile hurts your confidence, oral health, and quality of life. We want to restore your smile with dental implants. If you are considering dental implants, we would like to offer a free consultation to prepare a comprehensive treatment plan for your specific diagnosis. 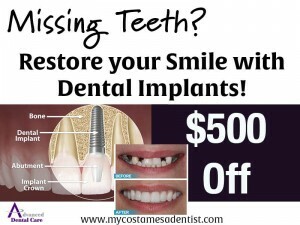 In addition, we are offering a limited time special for a $500 savings off dental implants through October 31, 2016. If you are ready to replace your missing teeth with dental implants, please contact our office to schedule a consultation. Don’t miss out on a wonderful opportunity to improve your smile and quality of life.